Here is a lovely story of a fan that got to meet the Beatles when they arrived at the train station. Much love and thanks to That Eventuality blog for posting the translation of this story. “In 1963, The Beatles sang their way into my young girl’s heart with ‘She Loves You.’ When The Beatles were due to come to Essen during a Blitzournee, it all came down to one question for me: how do I get there? My parents categorically declined it. My father, an officer with the railway police, spoke of ‘layabouts’ and ‘long-haired men’ and remained steadfast. Only to then surprise me with confidential information. After making me promise not to breathe a word to anyone, he told me that he was one of the officers on duty at the trainstation where The Beatles would arrive and said I may be able to experience the arrival of the train. The day before, we found out that my school friend Rita could also come along; the destination of our dreams: Mühlheim-Styrum. My God, I was excited when we arrived there on 25 June 1966. There was nothing going on, there were barely any barriers set up. Were we to have The Beatles to ourselves? When the chartered train arrived, I felt queasy. I’m not about to faint, I thought to myself. My father gave me the signal we had agreed upon, telling me what compartment The Beatles were in. I climbed aboard - and stood in front of The Beatles. My heart was racing and I couldn’t get a word out. All I could do was hold out my autograph book and a pen and silently ask them for their autographs. What a moment! You're very welcome - thank YOU for the kind shoutout. 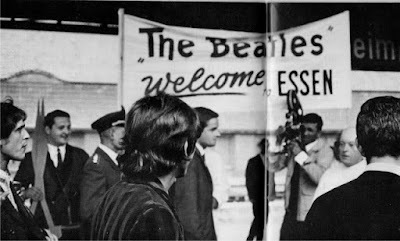 It has been fun researching some fan stories from each of the three German cities during The Beatles' brief tour and a treat to find some newer ones from more recent articles. As ever, thank you so much for all the time, effort and hard work you continuously put into your blog! Great. What fascinates me about seeing concert photos circa 1963 and imagining being there is the knowledge I wouldn't have had then - - that these guys were about to knock out track after track on album after album of astonishing music. And the crest of history they were surfing. The verve of it all.